We don't just park it, we innovate it, and here's why! TRAX powered assist trailer dollies / trollies are designed much different from all the other trailer parking solutions available today. Our rugged, compact tow dollies are professionally engineered to efficiently move your trailer almost anywhere. 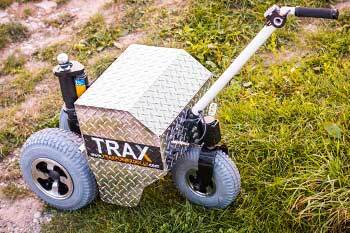 The soon to be introduced TRAX X2 motor design dolly will be the first TRAX dolly system with double motors. Each drive wheel will be powered by it's own motor allowing for skid steer style steering. The TRAX X2 will feature a single analog/variable speed joystick control. It will allow for complete 360º viewable coverage of your trailer move. Simply put, you can stand anywhere and park your trailer perfectly without any help from anyone. Our motors and transmissions operate so quiet that you can easily move your trailer even in the earliest mornings or very late evenings. Say good-bye to waking up the neighbours or nearby campers. TRAX electric motors are built to last, and are very quick, quite and run for long periods of time with no needed resting periods. We wouldn’t ever recommend using cheaply made winch motors that are loud, slow and require resting periods every 5 minutes or they will burn up. The design of our power dollies ensures that it clears the trailer's jack post, allowing for maximum steering radius, and our standard low profile wheels and tires are able to easily go under most trailer chassis. Want to go for a wider tire option for greater traction? We will be offering a variety of tire options in both height and width. The tow ball connection is uniquely designed for quick, easy, and stable connection to your trailer, ensuring the safest most secure connection to your trailer. No bending over backwards, or having to use any tools whatsoever! Simply lock down the hitch ball and pump. It works for many styles of trailer mounts including Bull Dog hitches, Pinto hitches, etc. Say goodbye to expensive, unwanted connection adapters,and expensive modified hitch balls other companies are forced to sell. TRAX motor controls are built for perfect trailer control with variable speeds. When you need to pickup and go quick, you can easily do so. Need to park your trailer within inches or less? You can easily slow things down to your comfort level and place your boat, camper / RV or any trailer in it perfect parking location. Power, Speed and Momentum are your ally, without them a power dolly that is capable of moving a 10k trailer can easily be stopped by a 1.5 or 2 inch curb. But if you have the trailer's momentum and speed the trailer's tires easily climbs most curbs. Park it Right, First Time, Every time!